When it comes to fishing with a single hand rod, I’m afraid I’m something of a dry fly purist! 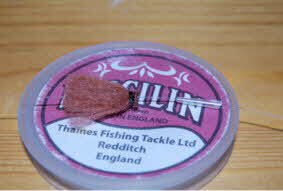 Well, precision casting stone fly nymphs to big browns or rainbows I’ve stalked in those gin clear New Zealand rivers, don’t however give me sleepless nights! I live in Norway in the small city of Elverum, in my mind the grayling capitol of Europe, and fly fishing for grayling is an activity for me all year. Cold winters in Norway, you think? Well due to the global warming, winters are not that cold anymore. Elverum is situated on the banks of river Glomma and this river with all hers tributaries; give us enormous opportunities for grayling. One of the tributaries, river Rena, is regulated with the big and deep lake Storsjöen as a basin. This gives a higher water temperature in the river flowing out of this lake. This effects also river Glomma from the conjunction with river Rena down to the city of Elverum. So, from my home, I only have to travel a couple of kilometres to fish for grayling all year. I experience dry fly action from late March to the beginning November, but in the edge of the season, only on calm, sunny days. Other days and in the winter, I bite the grass and fish with nymphs! To lob a jiggle of 2-3 heavy nymphs in the water, don’t involve any fly casting and you would probably do better with a long bait fishing rod! Well, the method is effective, but the reminiscence of competition fishing, gives me a bad taste in my mouth. There are a couple of other very good methods to succeed in nymph fishing. 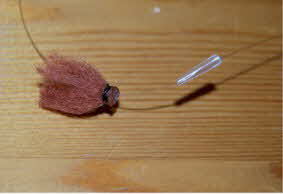 Last two seasons, I’ve been an advocate of using micro-nymphs, size 16-20 Knapek barbless hook tied with material and micro tungsten bead, very thin fluorocarbon leader and either a well impregnated dry fly as indicator or my new strike indicators. The dry fly, patterns like Rackelhanen, Streaking Caddis, Goddards Sedge and Elk Hair Caddis, work very well in more shallow water and as a bonus, a occasional grayling pick the dry instead of the micro nymph! 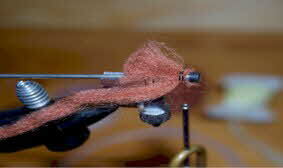 I tie the thin leader from the hook bend of the dry fly to the nymph, NZ-style. Of course, it’s time consuming to adjust the depth with this method. In the cold period of the season, you’ll find grayling grouped in deeper, slow flowing areas, and to reach this fish with those relative light micro nymphs, I use a long piece of thin, 0,12-0,10mm, fluorocarbon leader(tippet). The length of thin leader between indicator and nymph, 1,5 times of expected depth. 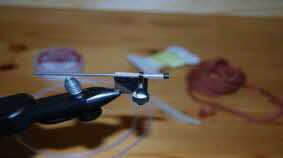 At this site, you find very good yarn indicators made with o-rings, and I’ve used these a couple of times. However I experience problems with them, sliding out of position or when I put the loop two times trough the o-ring, this curls the leader, look bulky and are not easy adjustable. My development of best strike indicators will be presented here, the development with mind of reducing wind resistance, making easy depth adjustments and root this in the fly tying tradition. A bonus with these indicators, is the fact that you can fish with very long leaders, or rather long length between indicator and nymph, without experience of indicator stopping in the top ring of your rod when trying to land the fish. This indicator will slide down your leader when hook up. 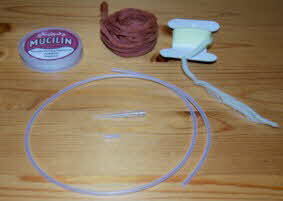 Things you need: good poly yarn (choice of your colour), salmon fly plastic tube material (the Frödin system), a good floatant and a thin plastic pipette or similar. The latter, you can get from the chemist. The idea is to have a conical thin plastic tube, so maybe you find other materials to serve this purpose too. 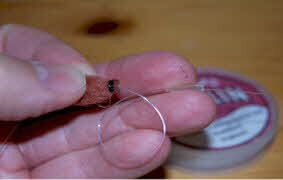 Cut a short, 5-8mm, piece from the salmon fly tube material and fix it in your fly tying wise as you would tying a salmon tube. Tie in poly yarn in the volume of your choice; more yarn in heavier lifting strike indicators. Whip finish and secure the “head” with Bison Vinyl Plastic, Zap-A-Gap or similar instead of head cement for better durability. 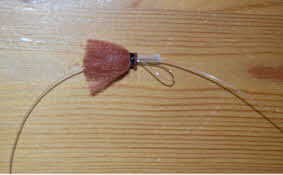 To fix the indicator on the leader, you need to put your leader through first the indicator and then the plastic cone, before you tie your nymph on. 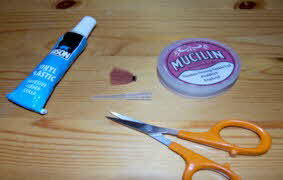 Then, make a simple loop between indicator and cone, before fixing the cone inside the indicator. This way you lock the indicator on your leader at the desired length between indicator and nymph. The brilliant thing now, when you hook a fish and the leader tightens, the leader will release the indicator and indicator and cone will slide down the leader. 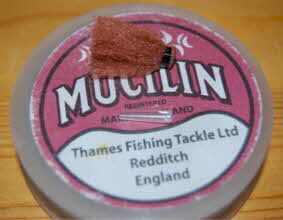 This to prevent problems when fishing with long leaders and landing fish. Well, this way I find enjoyment in fly fishing for grayling all year and teamed up with moderate heavy nymphs, these indicators are a pleasure to make a proper fly cast with!